Crowdsourcing for book recommendations has become one of my favorite things to do via social media. I love hearing how passionate people are about books and over the last several years, these lists have been my go-to source for so many wonderful reads! 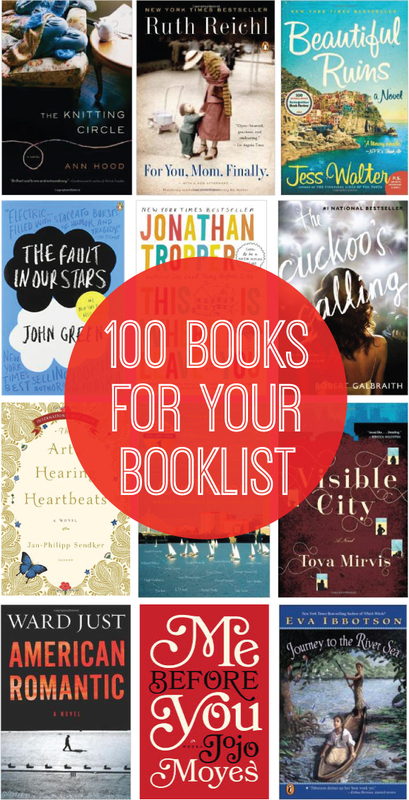 Following last year's 80 books for your booklist, I decided to canvas again and received 100 recommendations in a few days -- bookmark or print this list out for your next bookstore or library visit! I've included the name of the recommender(s) and any specific comments, to help guide your choices (I tend to start with books with multiple recommendations or enthusiastic comments!). If you have other recommendations not on this list, of course feel free to share via comment!